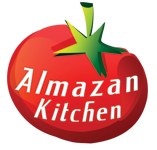 Welcome back to the AlmazanKitchen Blog, where we reveal our secret recipes! Are you ready to take a little break from your everyday work or study? Sit back, relax, imagine that you’re on our kitchen with us, listen to the nature around you, feel the fresh mountain air. Let every problem and every disturbance leave you. Today we will cook a saltimbocca, stuffed with homemade hot cheese and fresh sage, spiced with smoke, served with delicious young potatoes and spring onions. Wash the sage, potatoes and onions in the nearest waterfall, leave everything on the moss to dry. Cut open 300g free-range chicken breast, beat it off with a rock. Salt, cover with 70g grated homemade cheese with hot paprika, put sage leaves above. Secure with the few toothpicks. Olive oil your preheated pan. Cook the chicken for 5 min, pressing it with the stone, flip it after and cook for 5 more min. Chop 100g spring onions on medium pieces, add it into the pan and toss few times. Add 200g young potatoes, toss everything few more times. Deglaze the pan with full hands of water. Do you feel better? It works, right? Of course it does. For now, you always can repeat the recipe by yourself.